While flu can easily be confused with a cold, flu can cause fevers that colds can’t. By learning about flu symptoms, you can make sure that you know just what to do in case you catch it. Flu has similar symptoms and causes similar discomforts as many other diseases. While the influenza virus causes the flu, other illnesses are caused by other viruses. Since it’s difficult to know which virus is causing the disease, doctors usually group all these diseases as the ‘flu-like’ diseases. It usually takes a day or two for flu symptoms to show up after exposure to virus. However, these signs and symptoms, more often than not, look just like they’ve developed all out of sudden. Flu symptoms differentiate greatly in severity among healthy people. The common cold displays the same symptoms as flu in most cases. The major difference between the two is that the common cold is less intense than the flu. Another difference between flu and common cold is that while both show symptoms like headaches, fevers, pain in the body and tiredness, the symptoms show up abruptly in the case of flu while they build up slowly in the case of colds. There are a few symptoms that easily help identify that you are suffering from the flu. If you have been noticing the following few symptoms, then you can know for sure that the disease bothering you is flu. Dehydration is a major symptom of the flu with the reasons for dehydration either being that you don’t want to eat or drink anything because you are feeling very sick or being that you have been losing a lot of water due to diarrhea and vomiting. Regardless of the reason, dehydration remains a serious condition and can point towards H1N1 too in some cases. So, getting medical help as soon as you feel dehydrated is recommended. A runny nose is not just a symptom for colds but is also indicative of the flu. Make sure that you don’t allow the germs to spread by taking care of the runny nose with a lot of tissues. Flu causes fever as the body’s immune system rejects the infection and tries to fight it. A flu induced fever is usually around 100 Degrees Fahrenheit or even higher. However, it is important to note that it’s not necessary to get a fever during flu. Sore Throat is another common flu symptom with the soreness either being caused by the flu-accompanied cough or by irritation and scratchiness in the region caused by the virus itself. The irritation would increase and the soreness in the throat would get worse with time as the virus would intensify. A cough that doesn’t go away and continues to be a nuisance is often an early indicator of an illness like the flu. People with flu often complain not about just cough, but also about tightness in the chest and wheezing. If the flu intensifies, the cough may have phlegm though it hardly happens if the flu is detected and dealt with early enough. Too sudden and unaccounted for tiredness is probably the first symptom of flu and should be taken as a warning sign of the flu symptoms that are to come. People often relate fatigue and tiredness with colds, and while colds cause fatigues too, the fatigue is a lot more intense and sudden with flu. If you feel extremely tired and very weak when doing normal work, you should prepare yourself for other flu symptoms. A symptom which differentiates flu from cold is body ache and chills. Pain in the body is one of the earliest indications of flu, while people usually put it down mistakenly to workouts or extra work. Headaches and pain in the legs are the most frequent manifestations of an early flu. The body aches are usually accompanied by chills as well. It is also possible that you feel the chills sometime after feeling the body aches. Drinking fluids is important so as to keep yourself hydrated, especially when the flu is accompanied with vomiting and/or diarrhea. Fluids like water, herbal tea, soda and juices are all great for this purpose, though you should distance yourself from caffeine containing drinks. Taking in moist air would prove very helpful for dealing with flu symptoms like sore throat and breathing issues. Taking steamy showers frequently during the day or taking in the steam from the shower in the bathroom should do the trick. Having someone around to take care of you can really help during flu. The caregiver will ensure that you take the fluids which would keep you on track without making you do much yourself and this would prove helpful in not aggravating the tiredness and body aches as well. Compressing the forehead as well as the nose with a warm cloth can really help. You will find pain relief from the nagging headache and/or sinus pain through this process. A sore throat can be very painful and irritating during flu. An easy and interesting cure for the sore throat is the use of cough drops and hard candies. The drops and the candy can not only ease the throat but can help with the coughing as well. You continuously vomit even after only taking in liquids. Your breathing is accompanied with wheezing. The symptoms of flu are getting more marked with each passing day. A small kid or baby shows any flu symptoms or catches fever. In case you already suffer from any chronic conditions like a heart related illness, HIV/AIDS etc., you should ring your doctor immediately once you notice any flu symptoms. 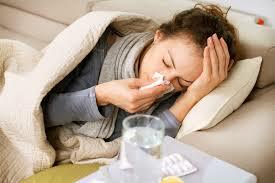 This is because flu can enhance the problems caused by the chronic condition you are suffering from.